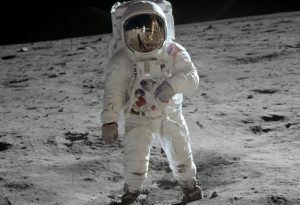 Buzz Aldrin walking on the surface of the moon. His helmet visor shows a reflection of the U.S. flag and the lunar lander, features to be depicted on proposed commemorative coins. Legislation introduced in the U.S. House of Representatives seeks coins in 2019 to commemorate the 50th anniversary of the first manned landing on the moon. Proposed gold, silver and clad coins would be curved similar to the popular 2014 Baseball Commemorative Coins, bear a common obverse design selected by competition, share a reverse depiction of the famed photo of Buzz Aldrin on the moon, and feature very unique edges. Entitled the Apollo 11 50th Anniversary Commemorative Coin Act and numbered H.R.2726, the legislation calls for up to 50,000 $5 gold coins, a maximum of 400,000 silver dollars, and up to 750,000 clad half-dollars in collector qualities of proof and uncirculated. Additionally, there would be up to 100,000 $1 five-ounce silver coins struck only in proof. The legislation was introduced by Rep. Bill Posey (R-FL) on June 10, 2015. "The United States remains the only country to have ever landed humans on a celestial body off the Earth and brought them home safely," said Rep. Posey who worked on the Apollo program as a young man. "Honoring that great feat and recognizing astronauts Armstrong, Aldrin and Collins, who made this historic journey, is what our bipartisan legislation is all about." July 20, 2019 marks the 50th anniversary of the Apollo 11 mission moon landing. According to the language in H.R.2726, the shared obverse or heads side design must be concave in shape and emblematic of the United States space program leading up to the first manned moon landing. To get a design, the Secretary of the Treasury would hold a juried and public competition with the winner receiving at least $5,000. "Representation of a close-up of the famous ‘Buzz Aldrin on the Moon’ photograph taken July 20, 1969, showing just the visor and part of the helmet of astronaut Edwin Eugene ‘Buzz’ Aldrin, Jr., in which the visor reflects the image of the United States flag and the lunar lander." "To the extent possible without significantly adding to the purchase price of the coins, the coins minted under this Act should be produced with the design of the reverse of the coins continuing over what would otherwise be the edge of the coins, such that the reverse design extends all the way to the obverse design." one quarter to the Astronaut Scholarship Foundation (astronautscholarship.org), to aid its missions of promoting the importance of science and technology to the general public and of aiding the United States in retaining its world leadership in science and technology by providing college scholarships for the very best and brightest students pursuing degrees in science, technology, engineering, or mathematics (STEM). The Citizens Coinage Advisory Committee (CCAC) has been recommending Apollo 11 50th anniversary commemorative coins since at least 2014, voting unanimously to include their suggestion for them in their annual report for two straight years. For H.R.2726 to become law, it must pass in the House, the Senate and get signed by the President. The legislation currently has 7 cosponsors and has been referred to the House Committee on Financial Services and Committee on the Budget. Bet this would be a winner. This is going to be big! I was waiting for this news! Keep the Maximum mintages low so that we do not have a repeat of the Kennedy sets… A huge rush for coins at issue and then the Gold and Silver sets have yet to sell out (due to increased mintages)! As a side note, Russia (I mean Putin) is lunching an investigation into validity of Apollo 11 moon landing. So, my guess is the U.S. Congress will likely approve the mintage. I think El Presidente will most likely sign it as well. Glad to hear these Commemoratives will be in a concave/convex presentation . Should result in a spectacular coin issue. Can’t wait to see the winning design. Remember the day clearly, hard to believe it’s almost been 50 years. Should be great for flipping!